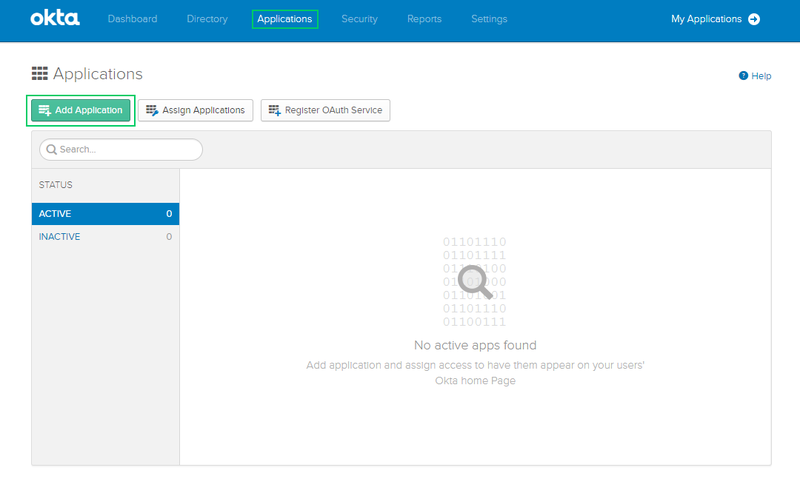 Authentication using Okta, a cloud-based identity management service, is available in Octopus 3.16 and later. 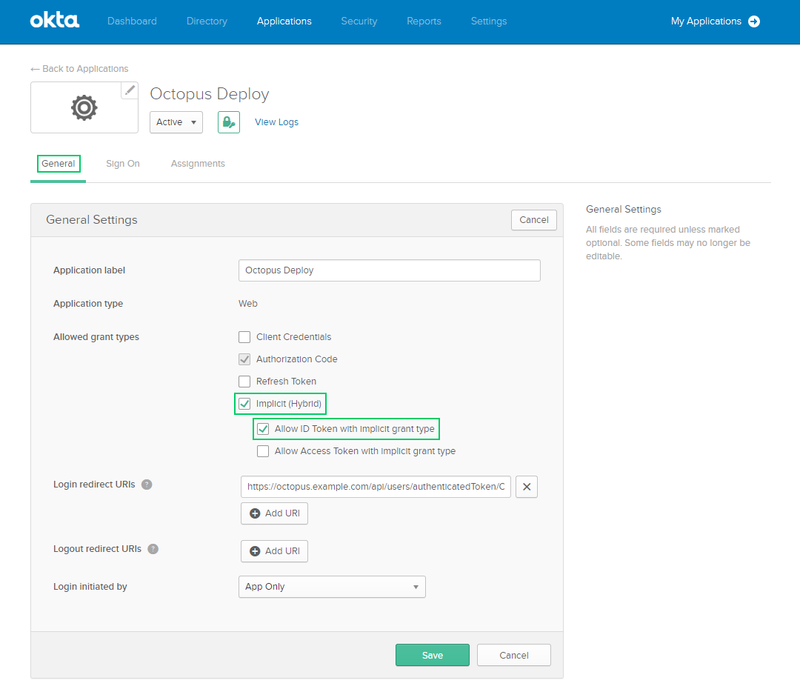 Configure Okta to trust your Octopus Deploy instance (by setting it up as an App in Okta). 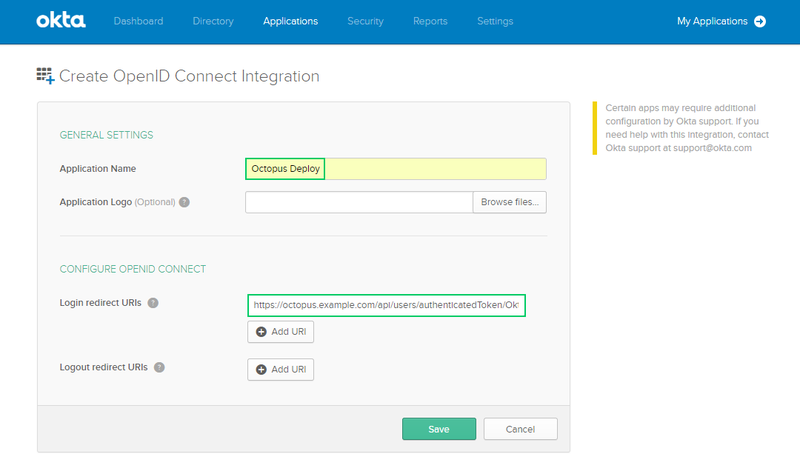 Configure your Octopus Deploy instance to trust and use Okta as an Identity Provider. 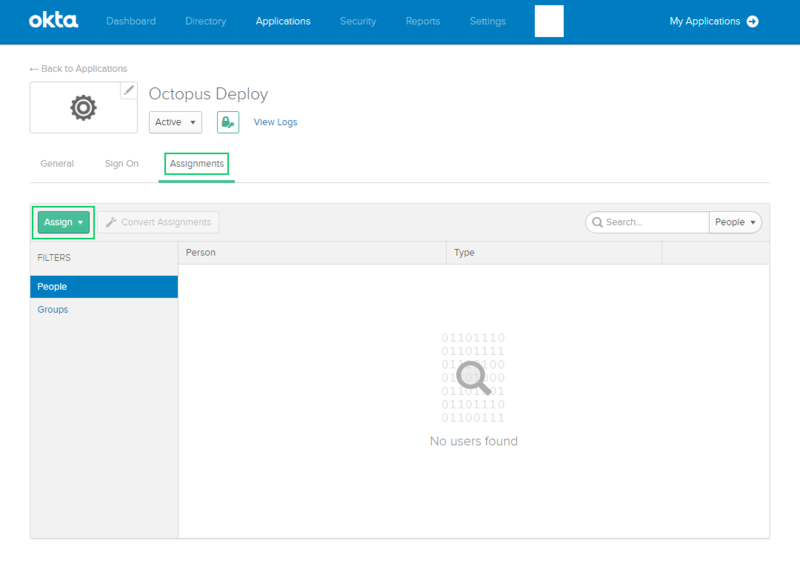 The first steps are to configure Okta to trust your instance of Octopus Deploy by configuring an App in your Okta account. You must first have an account at Okta. You can sign up for a free developer account. Once you have an account, log in to the Okta admin portal. After signing up to Okta you will receive your own url to access the Okta portal. For a developer account, it will look something similar to: https://dev-xxxxxx-admin.oktapreview.com. Select the Applications tab and click the Add Application button. Choose Web for the Platform and OpenID Connect for the Sign on method and click the Create button. Enter an Application Name like Octopus Deploy and for the Login redirect URIs enter https://octopus.example.com/api/users/authenticatedToken/Okta replacing https://octopus.example.com with the public url of your Octopus Server, and click the Save button. Please take care when adding this URL! They are case-sensitive and can be sensitive to trailing slash characters. We highly recommend using SSL, but we know its not always possible. You can use http if you do not have SSL enabled on your Octopus Server. Please beware of the security implications in accepting a security token over an insecure channel. Octopus now integrates with Let's Encrypt making it easier to setup SSL on your Octopus Server. Under the General Settings for the app you have just created, ensure that Implicit (Hybrid) and Allow ID Token with implicit grant type are both checked, under the Allowed grant types. Click the Save button to continue. If you want to allow users to log in directly from Okta then change the Login initiated by to Either Okta or App, set Login flow to Redirect to app to initiate login, and set the Initiate login URI to https://octopus.example.com/#/users/sign-in. 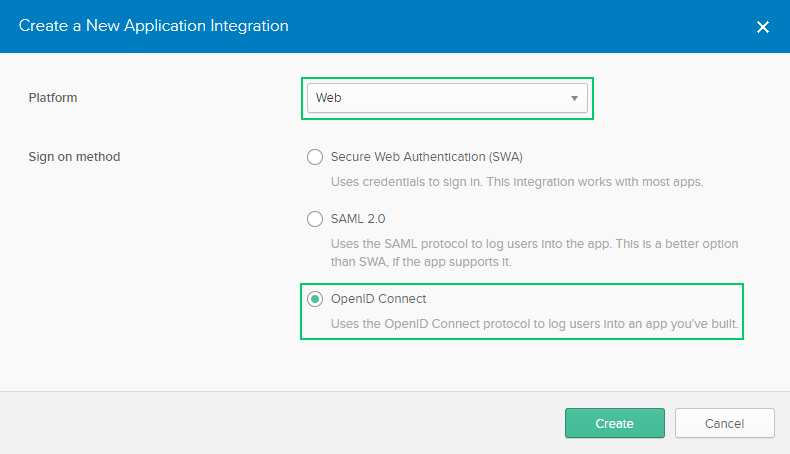 Now select the Sign On tab and scroll down to the OpenID Connect ID Token section. Take note of the Issuer and Audience as you will need both these values to configure your Octopus Server. Note that the Regex is . *, the period is important! 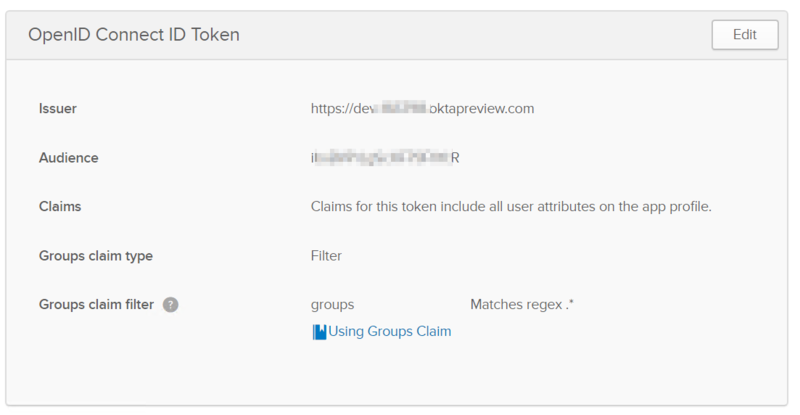 If you want to configure Okta to present your active directory groups, use a similar approach to Okta group integration, however we recommend that you use a Groups claim type of Expression instead of Filter. This expression will search active_directory for any groups that start with the name Octopus. and only return the first 10 results. Next you will need to assign your app to people or groups within your Okta directory. Select the Assignments tab and click the Assign button. You can assign your app to people, and to groups. To assign the app to all users, you can simply assign the default Everyone group to the app, and click Done. 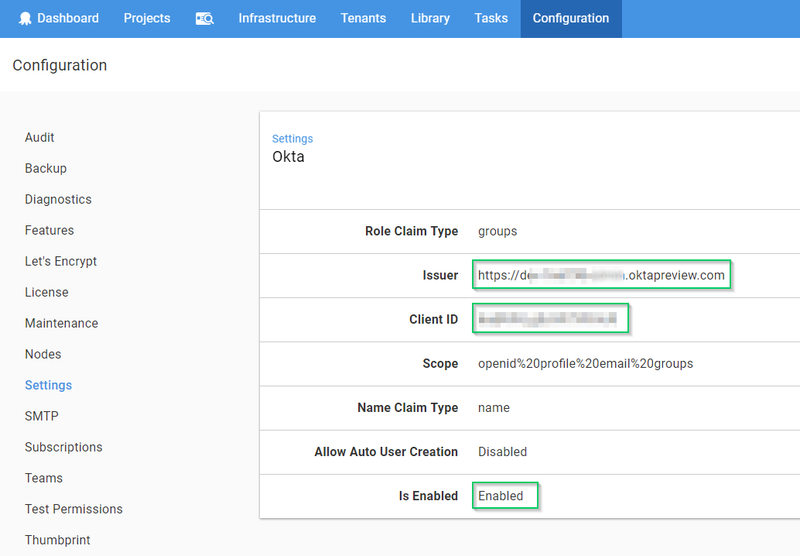 You will need the Client ID (aka Audience) and Issuer obtained from the Okta portal as described above. Your Client ID should be a string value like 0a4bxxxxxxxxxxxx9yc3. Your Issuer should be a URL like https://dev-xxxxxx.oktapreview.com. Alternatively these settings can be defined through the user interface by selecting Configuration ➜ Settings ➜ Okta and populating the fields Issuer, ClientId and IsEnabled. In versions prior to Octopus 2018.3.5 the Role Claim Type and Scope had different defaults and these values will need to be updated. For new installations of Octopus 2018.3.5 and greater these values should default to the above values. 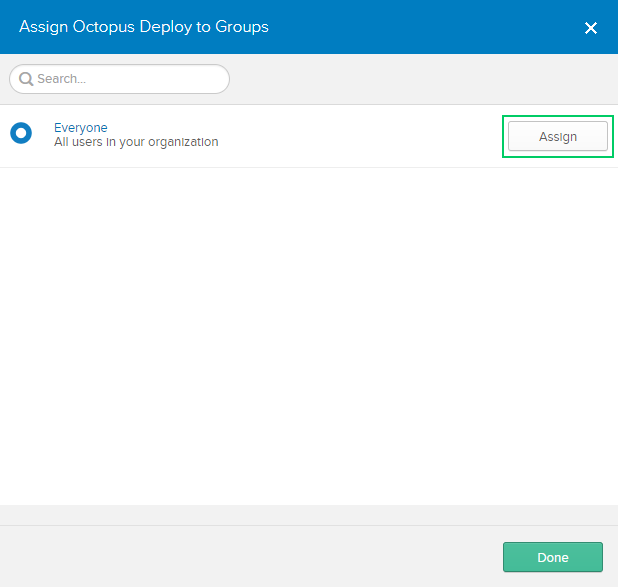 Octopus still requires a user account so you can assign those people to Octopus teams and subsequently grant permissions to Octopus resources. Octopus will automatically create a user account based on the profile information returned in the security token, which includes an Identifier, Name, and Email Address. We do our best to log warnings to your Octopus Server log whenever possible. If you are having difficulty configuring Octopus to authenticate with Okta, be sure to check your server logs for warnings. You can also check Okta logs by clicking the View Logs link on the Okta admin portal. Remember to remove or add slash characters - they matter too! Attempt to sign into Octopus using Okta and find the HTTP POST coming back to your Octopus instance from Okta on a route like /api/users/authenticatedToken/Okta. You should see an id_token field in the HTTP POST body. Don't worry if jwt.io complains about the token signature, it doesn't support RS256 which is used by Okta.